After Two Terrible Games In The Soul Calibur Series, My Soul Does Not Burn! | SDTEKKEN.COM - TEKKEN News Resource! After Two Terrible Games In The Soul Calibur Series, My Soul Does Not Burn! Aris and the Arm Chair Empire magazine goes in depth with their love/hate relationship for the Soul Calibur series. Does your soul still burn? Find out his thoughts by clicking below! Harada had some last minute news for us today. Apparently a new Soul Calibur game is now under development and the producer of the series is now Daishi Odashima. From what I have gathered, he worked on SC3 and SC4 and now he is the lead producer of the series. For those of you who are unfamiliar with the franchise, here’s a quick history lesson for you guys. In 2002 Namco released Soul Calibur 2 in the arcades. This was the first game in the series that was widely accepted as a mainstream competitive fighting game. The game was balanced, easy to pick up, and had a strong competitive scene across the country and the world all the way up until Soul Calibur 3. In 2005 Namco released Soul Calibur 3 on console only. This was a major mistake because at this point online patching was impossible. The game was riddled with game breaking bugs and balance issues that made it nearly unplayable. The proof was clearly in the pudding as it was never accepted as a mainstream fighting game and its tournament life on a national level lasted no more then a few months. In 2006 Namco released a arcade version of SC3 but at this point the community was dead and people didn’t want to pay for a game that they already bought on console. In 2008 Namco released Soul Calibur 4 on console once again. Now this game was interesting. The game seemed quite good at first. It had some hope of becoming a legitimate competitive fighting game. However, as the game evolved, certain balance issues were discovered. Namco addressed this with a major balance patch which was a breath of fresh air to the community. Unfortunately, because SC4 wasn’t widely played on pad in Japan, Namco failed to realize that the character Hilde had some easily exploitable abilities when mapping multiple buttons to do the same command. This was unfortunately never patched and is what eventually made SC4 arguably one of the most unbalanced games in recent history. Soon after, I quit playing Soul Calibur 4 because it became clear the game was a sinking ship and a waste of my time. The community died shortly after I left. 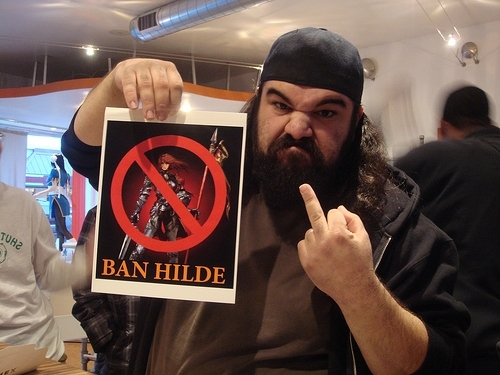 A few months ago, they finally decided to ban Hilde. Clearly a case of too little, too late. This brings me to my opinion of the franchise at this point. After the failure of Soul Calibur 3 and 4, I have personally lost faith. I may sound bitter and that’s because I am. The Soul Calibur series is very unique and has tons of potential in today’s budding fighting game scene, but I would be lying if I said that I have high expectations for the next game in the series. I would love to see Namco produce a high quality product this time around but I definitely won’t be holding my breath. My soul does not burn. What are you going to do about it Namco? This entry was posted on Saturday, December 25th, 2010 at 11:58 AM and is filed under aris, Avoiding The Puddle, Soul Calibur. You can follow any responses to this entry through the RSS 2.0 feed. You can leave a response, or trackback from your own site.